CD East coach Aaron Blanding is lifted by Tyshaun Pollard, Tyler Boger and Brandon Hickerson-Rooks during Mid-Penn football media day held at the offices of PennLive on Aug. 2, 2016. NOTE: Per Wikipedia: Central Dauphin East High School is a large public high school located in Harrisburg, Dauphin County, Pennsylvania. In 2015, enrollment was reported as 1,357 students in 9th through 12th grades. (by Mike Parker, ABC27 News) HARRISBURG, Pa. (WHTM) — Hard hits and hard lessons are part of high school football. Explaining to young men why a professional athlete is using the field to launch a political protest is just hard. “I respect and admire what he’s trying to say, I just don’t agree with the way he’s doing it,” says Aaron Blanding, head football coach for Central Dauphin East High School in Harrisburg, Pennsylvania. Blanding is referring to recent actions by San Francisco 49ers Quarterback Colin Kaepernick, who has been refusing to stand during the playing of the national anthem prior to his team’s NFL preseason games. According to Kaepernick, his intention is to shed light on alleged police brutality aimed at African-Americans. Blanding, who says he doesn’t expect to address the protest with his players, says while he supports every Americans’ right to protest, he thinks Kaepernick has made a mistake in his symbolism. 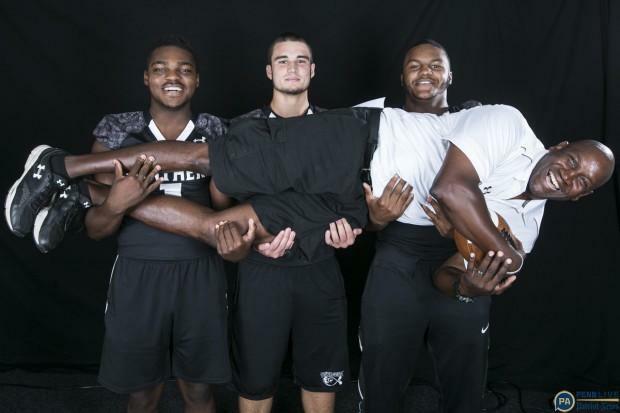 CD East players say they’ve heard about Kaepernick’s protest, but don’t see any reason to imitate it. The players, who also wear American flag decals on their helmets, say they plan to stand as normal during the playing of the national anthem this season. Other players say they worried that young athletes might imitate Kaeperinck, while not fully understanding the issue, or thinking about the consequences of their actions. Concerns included offending police and military who serve and protect their communities. Reprinted here for educational purposes only from ABC27 News. May not be reproduced on other websites without permission from ABC27 .com. NOTE TO STUDENTS: This is a controversial issue for many Americans. Be polite to those with whom you disagree when discussing these types of issues and always give the other person a chance to explain his/her point of view. Also, learn how to recognize when it is no longer productive to discuss an issue on which you strongly disagree. b) Do you agree with Coach Blanding? Explain your answer. 2. 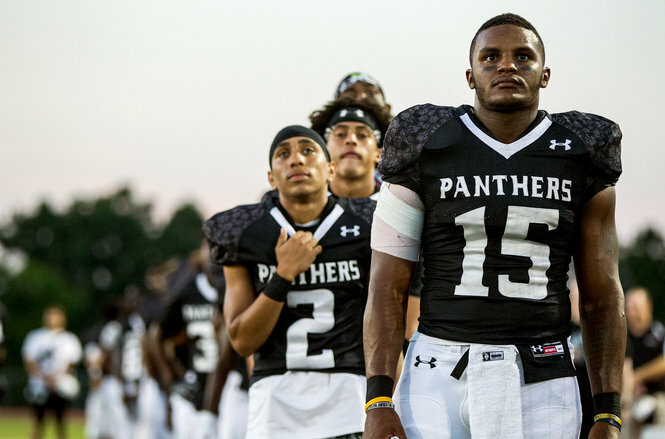 What do CD East players say they plan on doing during the national anthem this season? Why? 3. a) How did senior defensive player Brandon Hickerson-Rooks explain why he thinks players should stand? b) Do you agree with Hickerson-Rooks? Explain your answer. 4. How does CD East senior linebacker Tyler Boger view Kaepernick’s decision to sit during the National Anthem? Kaepernick began sitting during the national anthem this preseason as a silent protest to show support for people of color who he says are being oppressed in the United States, and to take a stand against police brutality. It’s an effort to use his voice and his position as a NFL player to effect change for the people who are suffering, and don’t have the same ability to create significant change. “I am not going to stand up to show pride in a flag for a country that oppresses black people and people of color,” Kaepernick said, via NFL.com. Kaepernick’s actions have led others in the NFL and other sports to sit or later take a knee – after meeting with former Green Beret and brief NFL long snapper Nate Boyer, Kaepernick decided to shift from sitting to taking a knee during the anthem. Some high school coaches, players and/or teams across the country have begun not standing for the National Anthem. Eight New York City Council members now refuse to stand for the Pledge of Allegiance, joining a protest started by City Councilman Jumaane Williams. a) Do you think Colin Kaepernick right about racial injustice? Is the U.S. a “country that oppresses black people and people of color”? Is there systemic racism in this country? Explain your answer. b) Ask a parent and ask a grandparent – have we made progress over the past 50 years?